C-flat major is a major scale based on C-flat. Its key signature has seven flats. 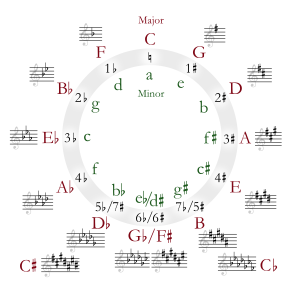 Its relative minor is A-flat minor, and its parallel minor is C-flat minor. This is usually replaced by B minor because C♭ minor's three double-flats make it generally impractical to use. Its enharmonic equivalent is B major. Most composers prefer to use the enharmonic equivalent B major because it has just five sharps. This page was last changed on 8 August 2016, at 18:55.